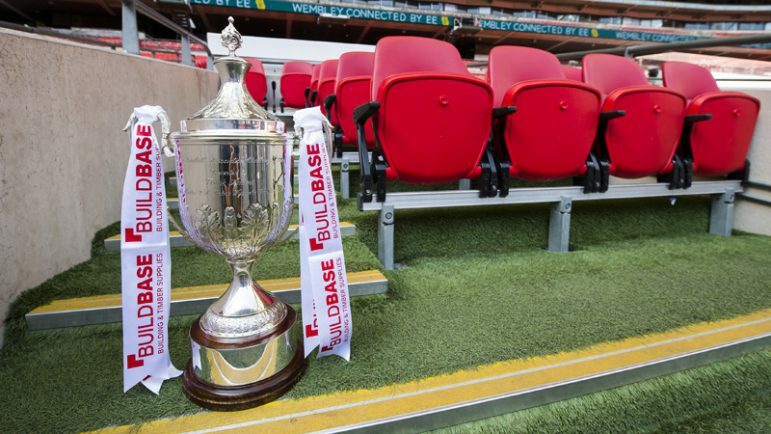 TWO goals from Jason Cowley fired Bromsgrove Sporting into the FA Vase quarter-finals for the first time in their history in front of a club record crowd at the Victoria Ground. A 1,487-strong gate witnessed the Rouslers secure a 2-1 victory over Toolstation Western League leaders Bristol Manor Farm to reach the last eight – just two rounds away from a dream trip to Wembley Stadium. One minute before half-time Cowley put Sporting ahead with a wonderful near post finish before grabbing his second after 54 minutes when he coolly slotted home from 12 yards out after collecting Ahmed Ali’s cut-back. But with just ten minutes remaining Manor Farm were given a lifeline when Troy Simpson netted from close range. And Sporting hearts were in their mouths just moments later as Simpson netted at the back post only for it to be chalked off for offside. The hosts then withstood a tremendous late Manor Farm onslaught to record a fabulous victory on an historic afternoon in Bromsgrove. For the first time in 15 years the Victoria Ground was holding more than 1,000 people for a Bromsgrove fixture and it did not take long for them to see the credentials of last season’s Vase quarter-finalists as Simpson fired wired of the mark just two minutes in. Lloyd Mills then volleyed wide nine minutes later for Manor Farm before Sporting’s Liam Spink saw a low shot desperately blocked and somehow cleared from danger. Chris Lloyd was getting plenty of joy down the right wing for Sporting in the early stages and after 19 minutes the pacey winger crossed to Cowley whose header deflected over the bar with the resulting corner falling to the feet of Sam Wills who blasted over. Ten minutes later Lloyd turned provider once again as his cross fell to Spink who controlled the ball well with his chest before hitting an instant volley wide of the far post. But the best chance of the game came to Manor Farm in the 32nd minute as danger-man Ben Bament found himself clean through on goal but could only lift his effort over the onrushing Sporting keeper Ryan Price and the crossbar. That miss almost proved costly as a fabulous block then prevented Sporting defender Craig Jones from opening the scoring for the hosts with a well-timed volley from Lloyd’s cross from the left-hand side. Both sides continued to press and with half-time fast approaching, Cowley sent the Victoria Ground into uproar as he provided a deft touch to divert Lloyd’s inch-perfect cross into the back of the Manor Farm net. Cowley’s goal meant he had scored in five consecutive Vase games and just nine minutes after the restart he was celebrating once again. Following a slip in midfielder from a Manor Farm defender, Ali strode his way into the visitors’ box before calmly pulling back to Cowley who was primed and to curl the ball into an empty net. That goal came as a relief to Sporting as Lloyd missed a one-on-one just moments after the start of the second half. Cowley will be wondering how he did not claim his hat-trick though, as two chances in the space of a couple of minutes just after the hour mark both went over the bar. A fantastic save from Manor Farm keeper Ashley Clark, who was by far their man-of-the-match, then denied Reece Hewitt who looked destined to make it 3-0 with just 21 minutes left to play after being plated in by Cowley. The introductions of substitutes Dean Stamp, Pete Sheppard and Harley Purnell then turned the game in the favour of the visitors as they pulled a goal back with 80 minutes on the clock. A long-range effort from Stamp was well saved by Price but the Sporting keeper was unable to hold on to the ball, giving Simpson the easiest of finishes from no more than six yards out. Just three minutes after pulling one back, it looked as though Manor Farm had completed a dramatic turnaround when Simpson tapped home Stamp’s cross at the back post but it was ruled out for offside – much to the delight of the Sporting faithful. But the onslaught continued and if it was not for some dogged and controlled defending, the visitors could easily have found the equaliser to send the tie to extra-time. After the 90 minutes were up, the fourth official showed five minutes of injury time was to come but more solid defending ensured Manor Farm would not break through. Spink almost made it 3-1 in the second minute of injury time after sending Tom Craine’s low pass the wrong side of post but it did not matter as the Rouslers held on to claim an historic victory to keep the Wembley dream alive and kicking.